the formula of the surface area of a sphere. how to calculate the surface area of a sphere. how to calculate the surface area of a hemisphere. how to solve problems about the surface area of spheres. how to prove the formula of the surface area of a sphere. A sphere is a solid in which all the points on the round surface are equidistant from a fixed point, known as the center of the sphere. 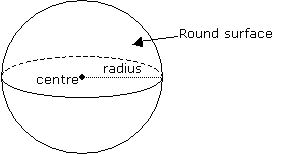 The distance from the center to the surface is the radius. Worksheet to calculate the surface area of spheres. How to find the surface area of a sphere? How to calculate the surface area of a sphere given the radius or diameter? A hemisphere is half a sphere, with one flat circular face and one bowl-shaped face. The surface area of a hemisphere is equal to the area of the curve surface plus the area of the circular base. Problem: What is the radius of the sphere given the surface area? Example: What is the radius of a sphere with a surface area of 900π? The surface area of a sphere is 5024 square meters. What is the volume of the sphere? Use 3.14 for pi. Round your answer to the nearest cubic meter. The radius of a sphere is tripled. a) Describe the effect on the volume. b) Describe the effect on the surface area. These two videos explain the Archimedes method of deriving the surface area of a sphere.